Not to be confused with Platine War. Brazil loses Cisplatina that became the independent Oriental Republic of Uruguay. Some peace terms favorable to Brazil, especially regarding its sovereignty over the Misiones Orientales. 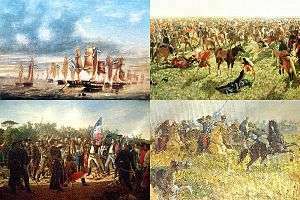 The Cisplatine War, commonly known as the Argentine-Brazilian War, was an armed conflict over an area known as Banda Oriental or the "Eastern Strip" (roughly present-day Uruguay) in the 1820s between the United Provinces of the Río de la Plata and the Empire of Brazil in the aftermath of the United Provinces' emancipation from Spain. Led by José Gervasio Artigas, the region theretofore known as the Eastern Bank, in the Río de la Plata Basin, revolted against Spanish rule in 1811, against the backdrop of the 1810 May Revolution in Buenos Aires as well as the regional rebellions that followed in response to Buenos Aires' pretense of primacy over other regions of the viceroyalty. In the same context, the Portuguese Empire, then hosted in Rio de Janeiro, took measures to solidify its hold on Rio Grande do Sul and to annex the region of the former Eastern Jesuit Missions. From 1814 on, the Eastern Province joined forces with the provinces of Santa Fe and Entre Rios in a loose confederation called the Federal League, which resisted Buenos Aires' authority. After a series of banditry incidents in territory claimed by the Portuguese Empire, the Rio Grande do Sul, Portugal invaded the Eastern Bank in 1816. 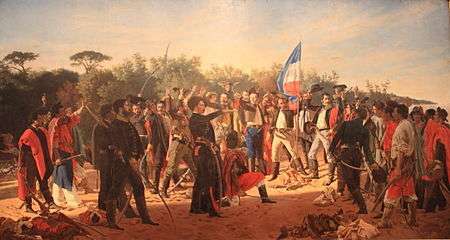 Artigas was finally defeated by the Luso-Brazilian troops in 1820 at the Battle of Tacuarembó. The Portuguese Empire (formally the United Kingdom of Portugal, Brazil and the Algarves since 1815) then formally annexed the Eastern Bank, under the name Cisplatina, with support from local elites. With the annexation, the Portuguese Empire now enjoyed strategic access to Río de la Plata and control of the estuary's main port, Montevideo. After Brazilian independence, in 1822, Cisplatina became part of the Empire of Brazil. It sent delegates to the 1823 Constitutional Convention and, under the 1824 Constitution, enjoyed a considerable degree of autonomy, more so than other provinces of the Empire. While initially welcoming Portuguese intervention in the rogue Eastern province, the United Provinces of the Río de la Plata eventually urged the local populace to rise up against Brazilian authority, giving them political and material support with a view to reestablishing sovereignty over the region. Rebels led by Fructuoso Rivera and Juan Antonio Lavalleja carried on resistance against Brazilian rule. In 1825, a Congress of delegates from all over the Eastern Bank met in La Florida and declared independence from Brazil, while reaffirming its allegiance to the United Provinces of the Río de la Plata. In response, Brazil declared war on the United Provinces. Brazilian Emperor Pedro I ordered his fleet to block the River Plate and its two main ports, Buenos Aires and Montevideo. The Argentina fleet moved south, first to Ensenada and then to distant Carmen de Patagones on the Atlantic Ocean. The Brazilian fleet attempted to take Carmen de Patagones in 1827 and thus tighten its blockade over Argentina, but Brazilian troops were eventually repelled by local civilians. On land, the Argentine army crossed the River Plate and established its headquarters near the Uruguayan town of Durazno. General Carlos María de Alvear invaded Brazilian territory and a series of skirmishes followed. Pedro I of Brazil planned a counteroffensive by late 1826, and managed to gather a small army mainly composed of Southern Brazil voluntaries and European mercenaries. The recruiting effort was hampered by local rebellions throughout Brazil, which forced the Emperor to relinquish direct command of his Army, return to Rio de Janeiro and bestow command of the troops on Felisberto Caldeira Brant, Marquis of Barbacena. The Brazilian counteroffensive was eventually stopped at the inconclusive Battle of Ituzaingó. While Brazilian troops were prevented from marching on to Buenos Aires, Argentine troops no longer managed to operate in Brazilian territory. Ituzaingó was the only battle of some magnitude in the whole war. A series of smaller clashes ensued, including the Battle of Sarandí, and the naval Battles of Juncal and Monte Santiago. Scarcity of volunteers severely hampered Brazilian response, and by 1828 the war effort had become extremely burdensome and increasingly unpopular in Brazil. That year, Rivera reconquered the territory of the former Eastern Jesuit Missions. Brazilian Navy and Argentine Navy in naval battle Punta Colares. The stalemate in the Cisplatine War was caused by the inability of the Argentine and Uruguayan land forces to capture major cities in Uruguay and Brazil, the severe economic consequences imposed by the Brazilian blockade of Buenos Aires, and the lack of manpower for a full-scale Brazilian land offensive against Argentine forces. There was also increasing public pressure in Brazil to end the war. All of this motivated the interest on both sides for a peaceful solution. Given the high cost of the war for both sides and the burdens it imposed on trade between the United Provinces and the United Kingdom, the latter pressed the two belligerent parties to engage in peace negotiations in Rio de Janeiro. Under British and French mediation, the United Provinces of Río de la Plata and the Empire of Brazil signed the 1828 Treaty of Montevideo, which acknowledged the independence of the Cisplatina under the name Eastern Republic of Uruguay. 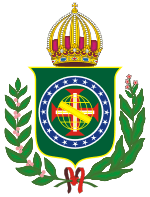 The treaty also granted Brazil sovereignty over the eastern section of the former Eastern Jesuit Missions and, most importantly, guaranteed free navigation of the Río de la Plata, a central national security issue for the Brazilians, but also an issue of great interest to the United Kingdom. In Brazil, the loss of Cisplatina added to growing discontent with Emperor Pedro I. Although it was far from the main reason, it was a factor that led to his abdication in 1831. Although the war was not a war of independence, as none of the belligerents fought to establish an independent nation, it has a similar recognition within Uruguay. The Thirty-Three Orientals are acknowledged as national heroes, who freed Uruguay from Brazilian presence. The landing of the Thirty-Three Orientals is also known as the "Liberation crusade". The war has a similar reception within Argentina, considered as a brave fight against an enemy of superior forces. The Argentine Navy has named many ships after people, events and ships involved in the war. William Brown (known as "Guillermo Brown" in Argentina) is considered the father of the Argentine navy, and is treated akin to a epic hero for his actions in the war. He is also known as the "Nelson of the Río de la Plata". Brazil has had little interest in the war beyond naval warfare buffs. Few Brazilian historians have examined it in detail. The national heroes of Brazil are instead from the Brazilian independence, the conflicts with Rosas or the War of the Triple Alliance. Despite the role of Britain in the war, and the presence of British naval officials on both sides of the conflict, the war is largely unknown in the English-speaking world. Wikimedia Commons has media related to Cisplatine War. ↑ SCHEINA, Robert L. Latin America's Wars: the age of the caudillo, 1791–1899, Brassey's, 2003. ↑ Spanish: El padre de la Armada Argentina. Used mainly in Argentina but also in other countries like the United Kingdom, see e.g. this BBC report. URL accessed on October 15, 2006. ↑ Spanish: Guillermo Brown or Almirante Brown, see e.g. his biography at Planeta Sedna. URL accessed on October 15, 2006. ↑ Irish: Béal Easa, see report at County Mayo's official website. URL accessed on October 15, 2006. ↑ Irish: Contae Mhaigh Eo, according to its official website. URL accessed on October 15, 2006.